Once again they donated, cooked, knitted (knat?) and purchased for Sam! This year’s Christmas craft and cakes sale made £530 on the day and counting! We had an amazing selection of gorgeous cakes and treats, all looked and smelt very tempting. There are some very talented bakers amongst us so it is no surprise that the cakes raised so much money! Some people forgot to bring any money with them so we have IOUs for about £60 taking us to around £600 mark – very respectable! Thanks all once again to all who supported stuff4sam either by making something, donating something or buying. Your support really makes a difference. This is just a quick note to thank everybody for their recent huge efforts. We have found what we hope is a piece of equipment with huge benefits for Sam. It’s the LiteGait system that we mentioned a few weeks ago. We have now trialed it with Sam at Stoke Mandeville and are getting it on loan at home. If it all goes well we can then put in our order to buy one for permanent use. Please have a look at Sam ‘walking’ for the first time since the accident in this You Tube clip. It was simply amazing to see him do this and what the video doesn’t show is Sam’s huge smile when he saw himself in the mirror walking!… we didn’t know what Sam would think… but he absolutely loved it and I think he felt free for the first time since the accident. Usually he is always in a chair, on a bed or with something up against him. In the walking machine he looked free and he was moving his head and shoulders so strongly it was fantastic. I can’t wait to use this as part of Sam’s training program. We call it Sam’s ‘Astronaut Training Program’ as we are doing nothing less than reaching for the stars and one day he will make it! So on one day we will do cycling, one day standing and one day walking… like a little athlete! Yippee! Its that time again – another flashing totaliser! This time we have reached the magic £22,000! Its taken just under four months to raise this latest thousand pounds. Saying that, the amazing thing is that it has been raised from small things – books, scarves and cakes! Big thanks to all who donated, created, bought and supported. You are great. Only a week until our London stuff4sam christmas crafts and cakes sale and we’re getting excited! 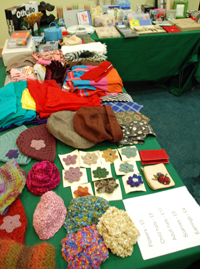 Donations of jewellery and knitted goodies are coming in as well as promises of baked delights. Watch this space for a special preview of items. We’re also planning a raffle with prizes so far including wine and Sanctuary smellies. Last year the raffle made over £200 and we had great prizes donated by local businesses and friends including Vue cinema tickets and dinner for two at the Ritz. We went to Seville and Lisbon for half term and had lots of fun exploring the cities. We tasted some port, rode on a tram, walked up to the castle and along by a river, tried our best to speak Spanish and Portuguese and visited lots of places. Our favourite place was the modern art museum in Lisbon. We forgot to take a Hi Sam poster with us but here is a photo of us in front of a HUGE statue of Jesus in Lisbon. 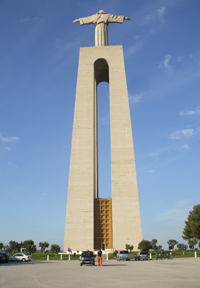 It is 110 metres tall and you can see right across Lisbon from the top. In the second picture you can see how big it is – if you look closely you can see a tiny Dan in front of it! Hope you are enjoying the fireworks. We will try to remember to take a Hi Sam poster on our next trip. Chief baker Neil S made some Snowflake Carrot Cupcakes during the week. His hungry colleagues snapped them up raising £30 for stuff4sam. Neil was getting in some practice (not that he needs it) for the stuff4sam Christmas sale on 23 November. His cakes and biscuits are sure sellers, the cake stall always has the longest queue! 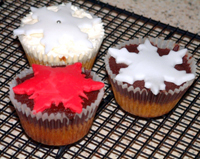 Neil also passed us a top tip – Delicious magazine is a source of great recipes – so get baking. More money banked today – £400 from the book boxes! What an amazing total raised over just a couple of months. Thanks to all who donate and buy to keep this rolling, recycling, resource going. We couldn’t do it without you! Extra thanks to the book monitors in Peterborough, London and Birmingham who collect the money and rotate the stock. This money takes us ever so close to £22,000. Our current total is £21,933. Well, we made it, as you have probably seen from the photos! After nearly 100,000 strokes, 135 miles, 47 locks, 35 bananas, 5 pubs, a couple of arguments, one broken oar and some extremely cross swans, we rowed into Putney just as the dusk was gathering on Thursday 29 September, bang on schedule. Most importantly, due to the generosity of lots of people, we have managed to raise over £3,000 for Sam! We really appreciate everyone’s contributions and messages of support – it is truly humbling. The money will go towards a partial body weight supported treadmill that will help Sam’s leg muscles to develop and get strong. We set off from Lechlade full of enthusiasm, after a rousing send-off from Sam, Neil, Kazumi, our families and dogs. The Thames at Lechlade is little more than a big stream and for most of the day we saw far more cows and sheep than people. We safely navigated our first lock, watched by a small audience, but didn’t get any points for artistic merit! Approaching our first stop at Babcock Hythe, the heavens opened and we got our first indication that the ‘waterproof’ roof of the skiff was anything but. We made our way to the Ferryman pub, where we optimistically pitched the tent and prepared the boat for camping. However after a few pints, the landlord kindly took pity on us and offered us a berth for the night. The pub was extremely friendly and we were inundated with donations from complete strangers, which was extremely touching. We had rowed a respectable 22 miles on the first day. Our second day started off with bright sunshine as we headed on past the dreaming spires of Oxford. Avoiding a near-collision with a tourist steamer in the middle of Oxford (it was in the wrong!) we pressed forward down towards the picturesque town of Abingdon. Nearby we began to look for the Plough Inn, our stop for the night. Then things went a little awry. The Plough was supposedly a short row up a tributary, but in the gathering gloom, we managed to row straight past the mooring for the pub and the next thing we knew, we were in a scene from Apocalypse Now, with my brother on the bow with torch in hand, trying to work out where on earth we were. James had an argument with a bush and the mood amongst the crew was not good! Luckily, we managed to find the pub, where the landlady was celebrating her 60th birthday. Despite having finished dinner for the evening, she very kindly cooked us dinner for the night and we were all set for sleeping under the stars. Alister and I decided to share the boat, with the other two in the tent. The night passed without incident, although in the morning, Alister and I both expressed great astonishment and admiration for our respective wives, after the snoring started to reach several decibels! Wednesday was our toughest day. At Pangbourne, it bucketed it down with rain and we got absolutely soaked. In the book, Three Men in a Boat, they abandon the trip at this spot and catch the train to London. Tempting as it was, we pressed on, only to snap one of the oars coming out of Caversham Lock. We made it through Reading and stopped at the very pretty village of Sonning, where we found the warmth of a hotel to get some much needed drying out. Alister’s parents had been following us all day with much needed support and words of encouragement and it was great to catch up with them in Sonning, where they very kindly bought us dinner. We left early the next morning, intent on getting to Windsor by nightfall. 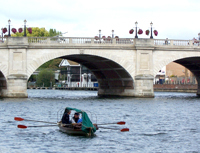 We rowed down the famous Henley Regatta course, but we were going against the wind and it was like rowing through treacle. It was more Vanessa Redgrave than Sir Steve Redgrave! From then on it is very picturesque, going through places such as Marlow and Windsor, with the castle looking amazing from the river. We made it to Datchet (31 miles for the day), where we found a delightful B&B run by a Slovakian, and then found a great Italian restaurant for dinner, run by Albanians! We never knew that Datchet was so cosmopolitan! The final day dawned and we were set for our run into London, a total of 33 miles. The river was becoming very wide now and you could really feel that London was dragging us in – although our limbs were aching with tiredness. 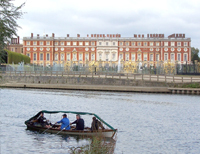 We were just rounding the river bend by the magnificent Hampton Court when we heard a holler – it was Toby’s father-in-law, who had come to greet us with a welcome shot of whisky and hot coffee, which was much appreciated. At Teddington Lock, we left the relative safety of the upstream Thames and hit the tidal stretch. It becomes a completely different river with very strong currents and eddies and you really need to have your wits about you. The tide was rushing out as we hit Richmond and you are really able to get up a good head of speed. So much so, that at Barnes bridge, we stopped at the University of London rowing club, as we didn’t want to arrive in Putney before our many supporters (mainly our mothers) arrived. And then sadly it was all over. The floodlights of Fulham football ground came into view and Putney Bridge appeared around the bend of the river. We are planning to row from Putney to Southend Pier (the official end of the Thames) next year and are also looking to enter the Great River Race. We will return!! Thanks one and all for all the support – it has been great.